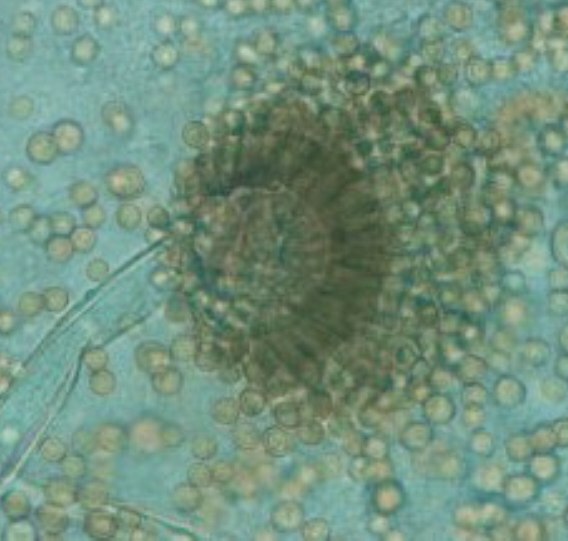 Aspergillus flavus has a world-wide distribution and is mainly isolated from tropical and subtropical areas. A. flavus can be isolated from soil but more attention has been focused on its' isolation from agricultural crops and products (ex. peanuts). In indoor environments A. flavus can be isolated from food, wood and wood products, and other building materials. Aspergillus flavus is a relatively fast-growing fungus that grows well at 25oC and 37oC. Colonies, which appear tufted at maturity, tend to range in color from greenish to yellowish. However, most colonies are typically parrot green or yellow green/olive green. The reverse side of colonies tends to gold to red-brown. Vesicle: Uniseriate or biseriate, radiate to columnar. Stipe is rough spiny, variable length. Conidia globose to ellipsoidal with smooth to slightly roughened walls. Aspergillus flavus is known as human, insect and animal pathogen and is a common agent of mycotic sinusitis. A. flavus is a main agent of human allergic bronchial aspergillosis with symptoms like fever, vomiting, coma, and convulsions. A. flavus can also cause infection of the external ear. Aspergillus flavus can cause aspergillosis, which is most commonly an infection of the lungs and sinuses that grows throughout the mucus. Several symptoms are associated with the infection including chest pain, cough, uneasy breath control, fever, and sweating. In immunocompromised patients (ex. cancer and AIDS) aspergillosis may result in fatality. In these cases the fungus is able to grow from its origin within the lungs to blood vessels and eventually be transported to other organs through the blood. A. flavus produces aflatoxin-B1 as a very potent carcinogen andteratogenic, which can cause aflatoxicosis. Ingestion of this toxin can cause liver and lung cancer. Traumatic cases are associated with underlying diseases like diabetes.